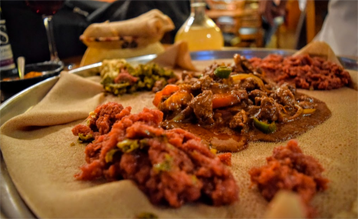 Wolkite is a family run restaurant where you experience the sincerity of the Ethiopian food. We have strived to build a solid respected reputation based on certain principles; natural, authentic Ethiopian food with a signature cuisine and the best culinary traditions served by welcoming staff in pleasant and easy going surroundings. At Wolkite we always strive to use authentic ingredients - so our customers can experience Ethiopia. Perfect for new comers to share, this set menu for two features a selection of our most popular veggie dishes, such as shiro wot, miser wot, ater wot ,gomen , azifa , fossolia , zimamujat and salad. Perfect for new comers to share, this set menu for two features a selection of our most popular meat dishes, such as :-kitfo, , alcha wot , dorowot , lega(Awaze) tibs, aybe and salad. Perfect for new comers to share, this set menu for three features a selection of our most popular chief selected mix of meat and veggies dishes with salad. One of the best restaurants in London. Fantastic food, welcoming atmosphere, good service and great value - it is cheap compared to most London restaurants, especially good ones. The food is fresh and pretty, but the best thing about it was the texture. Injera are like a face sponge that you scoop the multitude of flavours up with and eat. What a great experience at a great price. 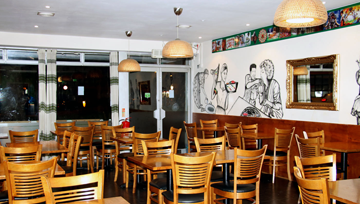 We've had Ethiopian a few times before, this place ticks all the boxes. Great value, lovely staff, beautiful food. The St George & Castel beers never fail, and the honey wine was pretty nice too. HIGHLY recommended, especially if you've never experienced this amazing food before.